I can't help myself....I am addicted to making these screen tote bags! I found this adorable Loralie floral fabric at a quilt shop in Celeste, TX ~ The Quilt Mercantile, a few months back and didn't know what I was going to make with it (you don't have to know what you are going to do with it to buy it, right?) but figured it would be a tote of some sort. Just wish I had bought more fabric now - isn't that always the case? I added a zipper to this bag and tabs on the ends of the handles to jazz it up a bit. 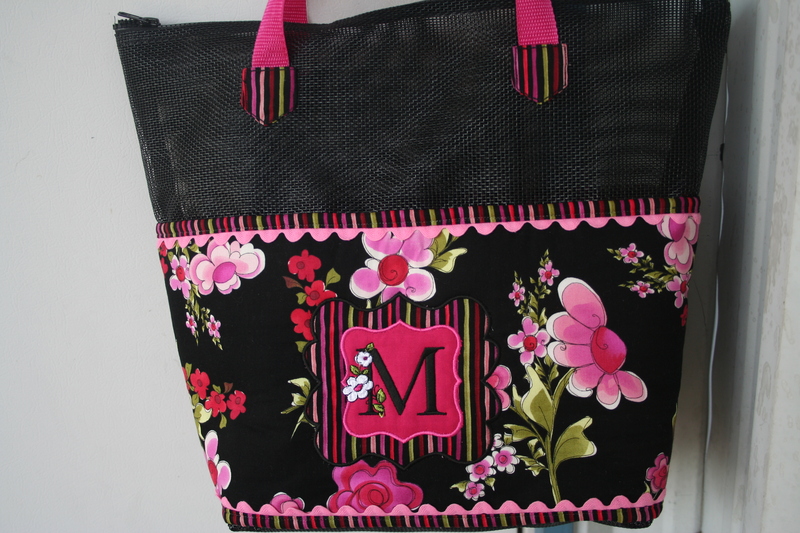 The applique with the monogram on the front is the Marie Frame from Planet Applique. What do you think? Michelle I am sew in love with this bag I cannot even tell you. Would you mind sharing what the screen is that you use and the pattern. I NEED to make one of these. Thanks for all the sweet comments! The bottom is screen. You could add a covered cardboard insert if you wanted but it is sturdy enough without it. Love it as usual. But M has to stand for Mom so you can send it my way LOL. Love you Love your work!!!!! You’re funny! Thank you gf. Michelle…what beautiful work you do. Love it.